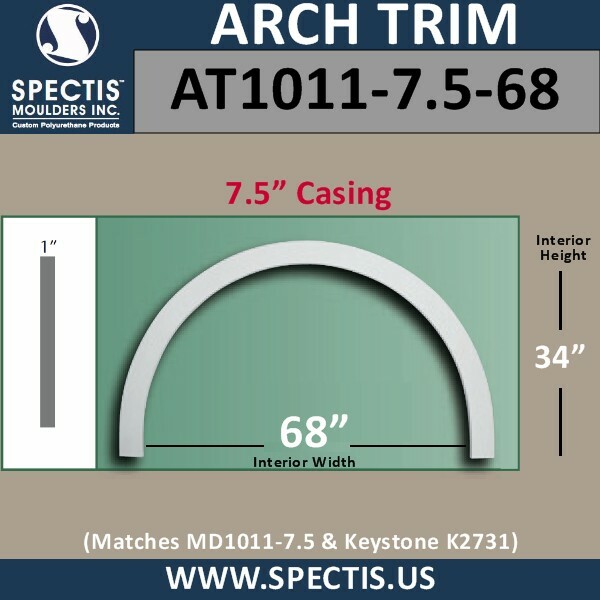 Arch Top 7.5" Casing with 68" inside Diameter-Matches MD1011 and Keystone K2731. Spectis Moulding makes building materials products for new construction and remodeling jobs. Spectis manufactures great high density polyurethane products that are superior to Fypon. From the primer base to the density of foam, Spectis trim molds are a great way to decorate any space you own. All of the spectis products come primed and ready to install for interior and exterior use on ceilings, walls and floors. If you have any questions, please don't hesitate to call us at 1-877-692-9125 Extention 3. All products are shipped from Canada and are Crated or boxed very well for shipping. Spectis also makes moldings, mouldings, balusters, railings, blocks, gingerbreads, columns, sunbursts, keystones, arches, louvers, medallions, niches and much more. Does Spectis Moulders products come with a warranty? Yes. All Spectis Moulding products are fully backed by a Manufacturer’s Warranty. Is Spectis Products load bearing? Our Spectis moulding products have a lot of great benefits, however, it is not recommended for use in load bearing applications. In applications that require carrying a load, you can use a metal support beam or pole to carry the load. Then use any of our Spectis Trim Products to cover up the support beam. How are urethane products installed? Installation of Spectis Moulding products is very easy. Spectis Moulding urethane products are installed the same way wood products are, using nails, glue, or screws. Spectis Moulders Urethane products has about the same density as pine and can be cut or drilled with standard woodworking tools. Spectis products are made from urethane. What is urethane? Polyurethane is created by mixing isocyanate and resin. The mixture is poured or injected in a liquid state into Spectis's custom moulds. Once in the mould, a chemical reaction occurs, causing the urethane to expand and quickly harden. The mixture is kept under pressure in the mould as it expands to any desired shape. When fully formed, the product is removed from the mould, the excess removed, and given an exterior grade primer coating. Urethane or Polyurethane is an advanced building material that has amazing benefits vs. it's wood counterpart. Will Spectis Urethane products last outdoors? Yes they will. Spectis products are an excellent choice for interior or exterior projects because they will not rot, crack, or split like wood, and they are water-resistant, and impervious to insect attacks. No. Spectis products are factory-primed and ready for finishing. or for Mobile Users Click on the Catalog below.